High altitude workers’ compensation perspectives from Professor Duff’s not- so – secret base of operations at the University of Wyoming in mile – and – a -half – high Laramie. As the grandson of a coal miner and a former blue collar worker and Teamster, I approach workers' compensation differently than many academics. I cannot really be unemotional about the subject but that does not mean that I am irrational about it. I try to take seriously all perspectives at play within this complicated subject while refusing to abandon my social justice orientation. The nature of the right. In my judgment conflict between workers' compensation perspectives arises chiefly from different views on the workers' compensation right. As a torts professor I never lose contact with the notion of workers' compensation as a substitute for a historically-rooted tort right that must remain "reasonable" to continue to be acceptable as a substitute. A competing perspective sees workers' compensation as, in essence, a form of insurance that is modifiable at will by a state legislature. 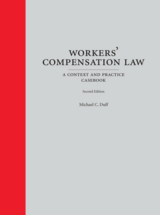 Although I may be oversimplifying a bit I really do believe that workers' compensation debates often boil down to the nature of the workers' compensation right.